Ryan Lucey scored 11 of his game-high 24 points in the fourth quarter as Fairport held on to a 51-43 lead to win the matchup of the last two Section V Class AA champions. The junior forward knocked down five three-pointers and went 3-of-4 from the free throw line. Max Molisani netted nine of his 14 points in the second half as the Fairport Red Raiders outscored McQuaid (No. 14 NYSSWA Class AA), 38-33. The junior guard hit two shots from beyond the arc and went 4-of-5 from the foul line. Brett Heininger netted 12 points. The senior forward knocked down three long-range shots. Senior guard Vanzell Johnson scored 10 points on two shots from beyond the arc, got to the free throw eight times and converted four attempts. For McQuaid, Kobe Long scored all 22 of his team-high points in the first, third, and fourth quarters. The junior guard knocked down four shots from beyond the arc and went 4-of-4 from the charity stripe. Jermaine Taggert had 16 points in the second half and finished with 21. The junior forward hit four three-pointers. Senior center Connor Zamiara chipped in 10 points. Other scorers- Fairport: Stefan Milinkovic (8), Andre Starks (3), Collin Espada (1), McQuaid: Seamus Hogan (3), Michael Maloney (2), Harry Bruu (2). Daniel Cook poured in a game-high 27 points and hauled in 15 rebounds for his 14th double-double of the season as Pittsford Mendon (No. 3 NYSSWA Class A) remained one of the two undefeated teams in Section V. The senior forward hit nine shots from inside the arc, went 9-of-9 at the free throw line and swiped five steals. Michael Harrington netted 19 of his 21 points in the first half as the Pittsford Mendon Vikings surged out to a 45-28 lead going into the locker room. The senior guard made seven shots from inside the arc and two three-pointers. Jacob Shadders scored all 13 of his points after the first quarter in which the Vikings held a 20-16 edge. The sophomore guard knocked down three long-range shots and dished out 10 assists. Connor Krapf had 11 points in the second and third quarters combined as the Vikings outscored Leadership, 44-27. The senior guard finished with 13 and grabbed seven rebounds. For Leadership, senior guards Nate Doyle, Jr. and Rondell Watson each knocked down three shots from beyond the arc in the fourth quarter. Doyle finished the game with seven three-pointers made en route to 23 points. Watson scored 17. Sophomore guard Maurice McKinney chipped in 10 points and went 3-of-3 at the foul line. Northstar Christian (16-0) is the other remaining undefeated team in Section V. Other scorers- Pittsford Mendon: Kyle Hennessey (6), Caleb Arena (4), Nate Strauf (4), Kevin Keneally (2), Leadership: Kennyh Hardeman (8), Shamir McCullough (5), Marquise Sabalier (2). Mason McFollins netted 12 of his game-high 30 points in the fourth quarter as Batavia held on to a 40-36 lead for its fourth win in the last five games. 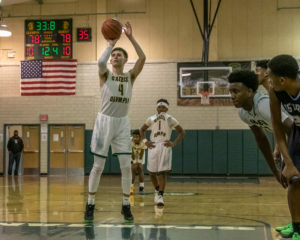 The senior guard knocked down six three-pointers, got to the free throw line 10 times and converted six of his attempts. McFollins hauled in 12 rebounds and handed out four assists as well. Senior guard Andrew Francis scored all 11 of his points in the first three quarters. For North Tonawanda, Dante Moultrie had 11 of his team-high 16 points in the second and third quarters combined as the Lumberjacks outscored the Batavia Blue Devils, 30-24. The junior guard hit two three-pointers. Junior guard Noah Stoddard netted all 11 of his points through the first 24 minutes of gameplay. Other scorers- Batavia: Jake Humes (8), Camden White (4), Joe Martinucci (3), Zach Gilebarto (3), Caeden White (2), North Tonawanda: Tyler Macneil (8), Sebastian Reid (5), Walter Wisniewski (2), Jordan Cutter (2). Kevin Ryan scored 22 of his game-high 31 points in the first half as Pittsford Sutherland surged out to a 41-21 lead for its second win in as many days. The senior forward made 12 shots from inside the arc and went 7-of-11 from the free throw line. Matt Panara netted 12 of his 17 points in the second and third quarters combined as the Pittsford Sutherland Knights outscored Churchville-Chili, 42-24. The senior guard hit three shots from beyond the arc. Junior guard Ben DiGiovanni chipped in 10 points. For Churchville-Chili, Marcus Postell scored eight of his team-high 13 points in the first half. Junior guard John Keele had all 11 of his points in the first and fourth quarters combined. Other scorers- Pittsford Sutherland: John Luther (6), Lincoln Perinello (3), John Messina (2), Garrett Glanton (2), Connor Fitzsimmons (2), Churchville-Chili: Kamerin Poromon (8), Terrence Wilson (7), Griffin Stella (5), John Bagley (2), Marcellus James (1). Jeff Jung, Jr. amassed a career-high 50 points as Greece Olympia won its second game in less than 24 hours. The senior guard poured in 24 of the Greece Oympia Spartans’ 33 points in the third quarter to extend a 21-point halftime lead. Jung finished the game 7-of-10 from beyond the arc. The senior guard is the second player in Section V to score 50 points in a game this season after Gates-Chili’s Keith Slack did it on January 22 against Wilson Magnet. Sophomore guard Darnell Williams contributed 16 points. Sophomore forward Collin James chipped in 10. For Rochester Prep, sophomore forward Wesley Henderson scored a team-high 21 points. Senior forward Marques Thomas had 10. Other scorers- Greece Olympia: Zahir Greene (6), Latrell Smith (5), Ehnoc Tossah (3), Wesley Elmore (2), Rochester Prep: Alonzo Thomas (9), Jaquis Robinson (6), Josh Heath (2). Senior Trevor Chamberlain hit a 15 foot jump shot with :13 seconds remaining in overtime, and HF-L followed with a defensive stop to seal back-to-back victories for the Cougars. Brighton’s Lukas Stanat converted a pair of free throws and Nate Sponsel scored two of his team-high 14 points to give the Barons a 59-55 edge in overtime. Hayden Moss cut the deficit with a 3-pointer before Chamberlain delivered the game winner. Brighton led 33-29 at the half, but Jack Emerson connected twice from 3-point land while Derek Childs and Patrick Lustyk scored six and four points respectively in the quarter to give HF-L a 45-41 advantage. Lustyk took a feed from Chamberlain and finished a layup with :15 seconds on the clock to give the Cougars a 55-54 edge. Nate Martin hit one of two free throws with 1.6 seconds to go to tie the game and send it to overtime. Childs finished with 19 points and 13 rebounds. Lustyk added 10 points. Smith scored nine. Matt Falter scored 11 points for Brighton. Martin contributed eight. The game was played at Quicken Loans Arena in Cleveland, Ohio after the Dallas Mavericks and Cavaliers game. Other scorers: HF-L – Jack Emerson (6), Josh Vogt (4), Mitch Slymon (3) and Andrew Webster (3). Brighton – Chase Seibold (6), Najeeb Awad (7), Casey Mcdermott (6), Stanat (2), Calvin Tourangelo (2) and Agathia Visvesmian (2). For Victor, Matt Caggiano netted all 12 of his team-high points in the first three quarters. The junior guard hit two shots from the beyond the arc. Sophomore center Connor Williams chipped in 10 points. Other scorers- Victor: Phil Nwugwo (7), Chase Dickens (4), Will Tehan (4), Jake Gauthier (2), Jeremy Summerson (2), Jon Crowley (2). Joe Tronetti netted four three-pointers and scored 14 points as Wellsville (No. 22 NYSSWA Class B) tallied its fifth victory in the last six games. Liam McKinley contributed all 13 of his points in the second half and swiped four steals as the Wellsville Lions outscored Addison, 34-19. Gage Caldwell chipped in 10 and grabbed seven rebounds. Colin Cook scored 10 points of his own. Alec Acompora netted seven and had four steals. The Lions had 10 of their 11 players score. For Addison, Daniel Ames netted 13 of his team-high 15 points in the first half. The senior guard knocked down two shots from beyond the arc, got to the free throw line eight times and converted five attempts. Ames grabbed six rebounds as well. Junior center John Stierly collected eight rebounds and blocked six shots. Other scorers- Wellsville: Max Jusianice (9), Jimmy McKinley (5), Aiden Cook (4), Seth Sexson (3), Holden Hoffman (2), Addison: Gage Ames (9), Nick Sutryk (6), Shawn Ribble (4), Sean Dejaiffe (2), Ronald Dailey (1). Kyle Wade scored 20 points to lead Caledonia-Mumford (No. 10 NYSSWA Class C) to its fourth straight win. The freshman forward hauled in 11 rebounds and swiped six steals. “When Kyle Wade plays as aggressive as he was today, it makes us much better,” Caledonia-Mumford head coach Dan Dickens said. Junior guard Vin Molisani netted 12 points, grabbed eight rebounds, dished out eight assists, and had five steals. Senior guard Eric Wilson contributed 10 points of his own. Junior forward Joe Laursen chipped in 6 and collected 14 rebounds. Leading 33-23 at halftime, the Caledonia-Mumford Raiders started the third quarter on a 23-0 run and outscored Warsaw, 26-2, in the period. “I was really happy with how we competed today,” Dickens said. “We were very consistent today and active defensively which really got us going in the 3rd quarter.” For Warsaw, senior forward Dmitri Steele netted six three-pointers en route to 23 points. Junior guard Andrew Coleman chipped in eight points.